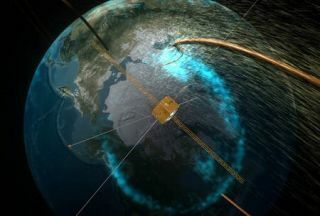 This artist's concept shows a magnetic portal connecting Earth's magnetic field connecting to the sun's. The spacecraft is on hand to measure the high-energy particles and fields flowing through the portal. Like giant,cosmic chutes between the Earth and sun, magnetic portals open up every eightminutes or so to connect our planet with its host star. Once theportals open, loads of high-energyparticles can travel the 93 million miles (150 million km) through theconduit during its brief opening, space scientists say. Called aflux transfer event, or FTE, such cosmic connections not only exist but arepossibly twice as common as anyone ever imagined, according to space scientistswho attended the 2008 Plasma Workshop in Huntsville, Ala., last week. "Tenyears ago I was pretty sure they didn't exist, but now the evidence isincontrovertible," said David Sibeck, an astrophysicist at the GoddardSpace Flight Center in Maryland. Researchershave long known that the Earth and sun must be connected. For instance,particles from the sun are constantly whisked away via the solar wind and oftenfollow magnetic field lines that connect the sun'satmosphere with terra firma. The field lines allow particles to penetrate Earth'smagnetosphere, the magnetic bubble that surrounds our planet. "Weused to think the connection was permanent and that solar wind could trickleinto the near-Earth environment anytime the wind was active," Sibeck said. "We were wrong. The connections are not steady at all. They are oftenbrief, bursty and very dynamic." Severalspeakers at the workshop outlined the formation of a flux transfer event. Oneidea is that on the side of Earth facing the sun, our magnetic field presses against the sun's magnetic field. And about every eight minutes, the two fields briefly reconnect,forming a portal through which particles can flow. The portal takes the form ofa magnetic cylinder about as wide as Earth. "TheseFTEs kind of look like roller pins, and they form as little blob roller pins atthe tip of the magnetosphere facing the sun," Sibeck told SPACE.com. "They can't decide which way they're going to slide around the Earth, so theygrow there into big roller pins and then they take off and sort of spirallyroll along [Earth's magnetosphere] like you're pounding out dough." More thanone FTE can form at once, he said, and they stay open for about 15 to 20minutes. In order tomeasure such FTEs, spacecraft must not only catch them forming but also be oneither end of the magnetic structures (either lengthwise or widthwise). Infact, the European Space Agency's fleet of four Cluster spacecraft and NASA'sfive THEMISprobes have flown through and surrounded these cylinders, measuring theirdimensions and sensing the particles that shoot through, Sibeck said. Whilethese measurements have nailed down the width of an FTE, the length is stilluncertain though one measurement put it at up to five Earth radii. One Earthradius is about 4,000 miles (6,400 kilometers). AstrophysicistJimmy Raeder of the University of New Hampshire used those measurements todevelop computer simulations of the portals. He found the cylindrical portalstend to form above Earth's equator and then in December, the FTEs would roll overthe North Pole. In July, they roll over the South Pole. Sibeck thinksthe events occur twice as often as previously thought, proposing two types offlux transfer events ? active and passive. When themagnetic cylinders are active, they allow particles to flow through rathereasily, forming important conduits of energy for Earth's magnetosphere, Sibecksaid. When passive, the cylinders have more resistance to transiting particles.The internal structure of a passive cylinder makes it tougher for particles andmagnetic fields to flow through. Sibeck has calculated the properties of passiveFTEs and hopes he and his colleagues will hunt for signs of them in datacollected with THEMIS and Cluster. The spacescientists at the workshop still want to figure out why the portals form everyeight minutes and how magnetic fields inside the cylinders twist and coil. Video ? Can You Time Travel?